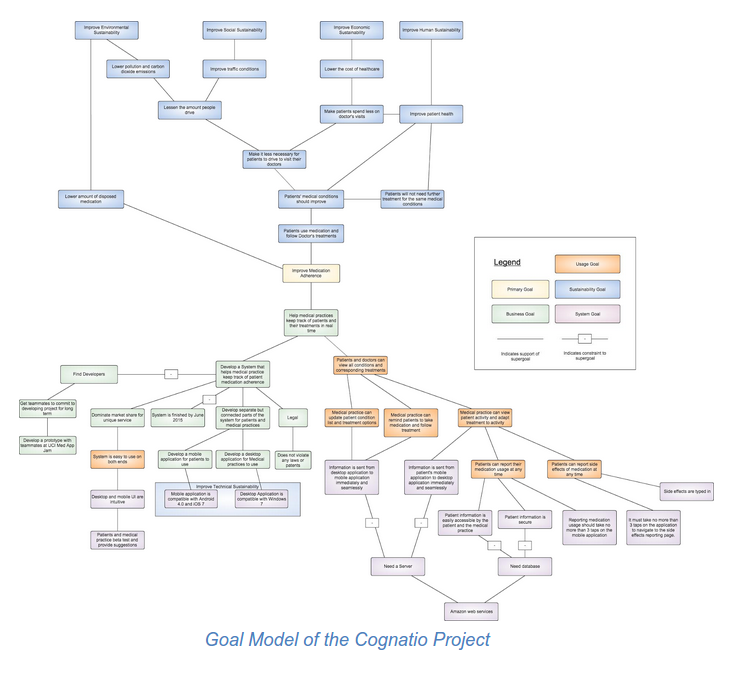 Project Cognatio is a two-tier system that relies on a mobile application to be used by medical patients and every day consumers and a desktop application to be used by medical practitioners. The overall goal of this system is to improve medication adherence among patients. Medication adherence is a common problem among patients who do not feel it is entirely necessary and/or sometimes forgets to take their medication as prescribed. There are many factors that cause this, but the aim of Project Cognatio is to reduce the impact of those factors and encourage patients to better adhere to their prescriptions. The system depends on collaboration between employees of the medical practice and the patients themselves to achieve the desired goal. The central feature of this system is its ability to exchange medication information between the mobile application and the desktop application via the Internet. The mobile application relays patient activity to the desktop application that will be viewable by members of the medical practice. The desktop application keeps the prescriptions on the mobile application updated so the patient understands which medications to take and when to take them. On the side of the mobile application, the user will have the ability to send usage reports of medications to his or her doctor to conﬁrm that he or she has consumed the medication at a certain time. The patient also has the ability to send user-typed reports of possible side effects that would be caused by the medication. The graphic user interface of the application will be designed so that reporting of medication usage will be easy. All members of the medical practice will have access to functions on the desktop application speciﬁc to their role in the practice. The desktop application will be proprietary for each individual practice that adopts the system, so it will be custom and accommodate for any special characteristics of the practice. Joseph Mehrabi was the requirements engineer applying the RE4S approach. The domain expert and external stakeholder was the outpatient dermatologist Dr. Don Mehrabi. They worked on the idea of a system aimed to improve medication adherence among his patients and met regularly to elicit and specify the requirements of the system. The artifacts were laid out in this document to earn Dr. Mehrabi’s approval on the goals and vision of the system. In addition to regular meetings with Dr. Mehrabi as the client, Joseph Mehrabi regularly met with Dr. Penzenstadler and Dr. Richardson to evaluate the progress and for feedback on the artifacts. The ﬁnal versions of the artifacts were used to answer the research questions in this paper. The purpose of the stakeholder model is to depict the stakeholders involved in the development and operation of the system and how they are related to the system. In the model below, there are ten stakeholders. Each stakeholder either has a direct or an indirect relationship with the development of the system. A direct relationship includes having a primary interaction with the development or usage of the system. An indirect relationship is applied to those stakeholders who are not primary actors in the development or usage of the system. The stakeholder matrix in  contains a more exhaustive description of each stakeholder involved in the development of the system. The Stakeholder Model provides a basis for the System Vision. The purpose of the goal model is to outline the goals and subgoals that the system will achieve and the goals to achieve proper development of the system. The main goal of this system is to improve the ﬁve dimensions of sustainability. 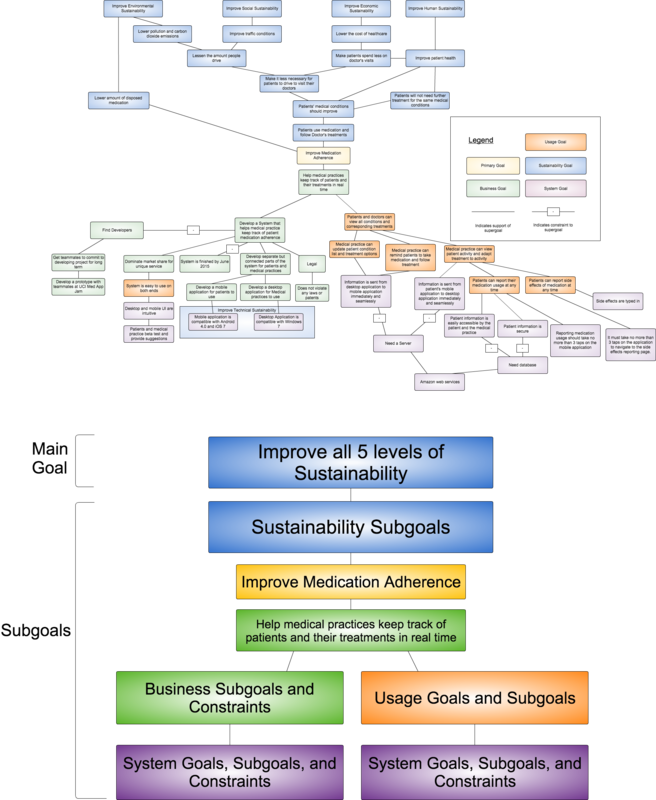 All ﬁve dimensions can be achieved through development, implementation, deployment, and successful usage of this system, which aims to improve medication adherence. The upper part of the goal model (Figure below) shows sustainability goals and allows for showing the relations between the different dimensions. The lower part shows the system goals and illustrates how the sustainability goals can be considered in the system goals. The most central and obvious sustainability goal for Cognatio is Human Sustainability, as system seeks to improve patient wellbeing. For example the system is well-developed, it will help patients adhere more closely to their medications, their health will improve, and Human Sustainability will be enhanced. The collection of these goals and subgoals would make for a functional system that will encourage patients to consume their medication as directed and provide medical practices with valuable information concerning their patients and their treatments. The purpose of the system vision is to give an overall view of the function of the system and how the stakeholders interact with the system. The business context of the system depicts the overall process of and the stakeholders involved with the development of the system. 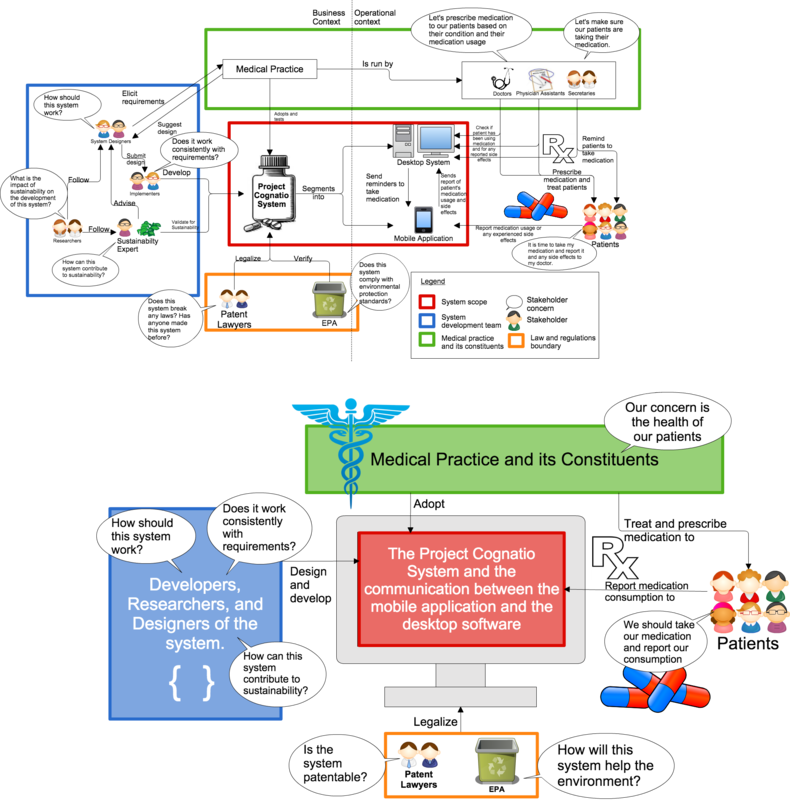 In the operational context, the function and purpose of the system is outlined by the interactions between the members of the medical practice, their patients, and the two components of the system: the desktop system and the mobile application. The purpose of the system is to improve patient health by encouraging them to take their medicine more regularly. This is done by doctors, physician assistants, and secretaries of a medical practice tracking their patients’ usage of medication. Secretaries will remind patients to take their medication when irregular activity is reported, and doctors / physician assistants will use the data produced by patients to adapt treatments for their patients based on their medication usage. If this is achieved, patients’ medical conditions will be improved, fostering the advancement of human sustainability. 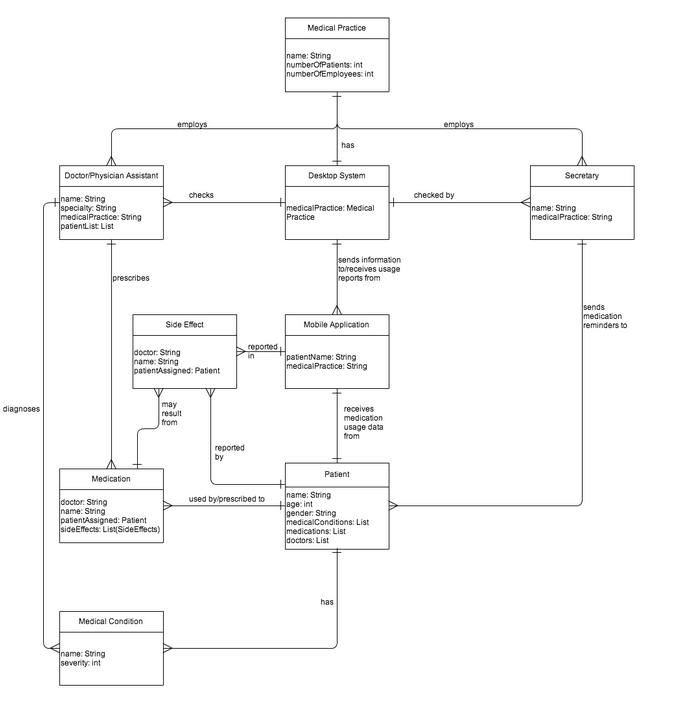 The System Vision uses input from the Stakeholder Model and the Goal Model, and provides a basis for the Usage Model. The purpose of a domain model is to map out the various entities, their corresponding attributes, and their relationships to other entities. The medical practice has three types of employees that interact with the desktop system: the secretary, the physician assistants (PAs), and the doctors themselves. Doctors and PAs have the same capabilities when interacting with the system. 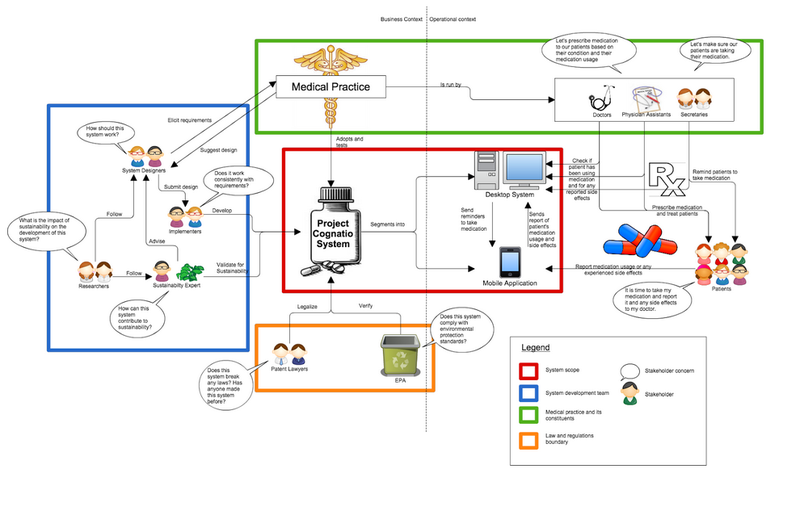 According to this model, they prescribe medications and alter the treatments of the patients. 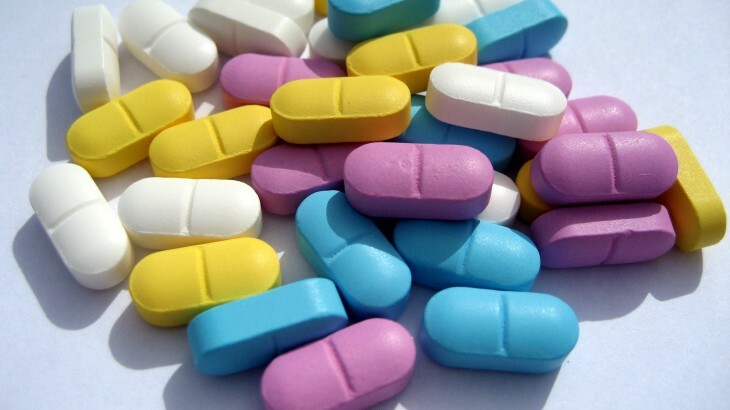 The secretaries, since they do not contain the legal capability of diagnosing patients and prescribing treatments, are given the capability of reminding patients to consume their medications when irregular adherence to the treatment is observed. 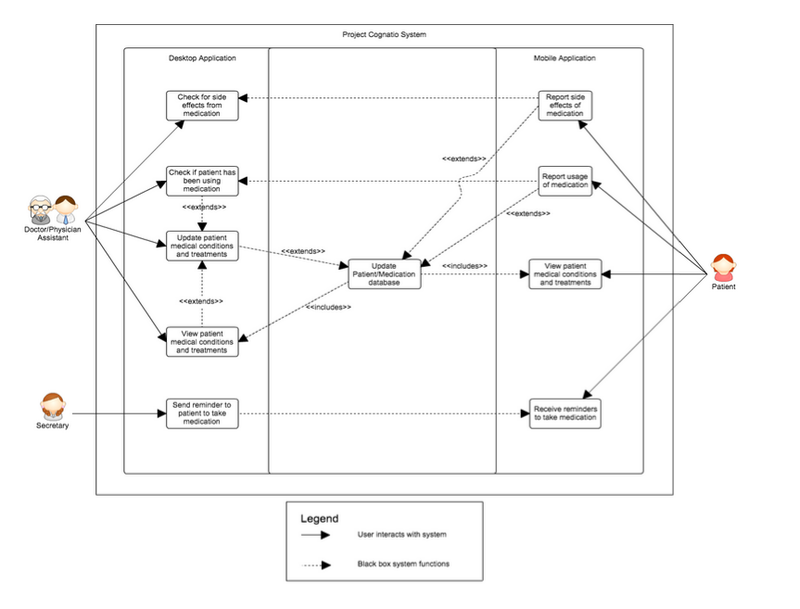 The purpose of the usage model is to give a black box depiction of how users will interact with the system and how the system responds to those interactions. It is a birds-eye view of the overall functions of the system. Also included are the three key components of the system: the desktop sub-system, the mobile application, and the patient database. Each function on either client subsystem of the Project Cognatio system interacts with either the database server or the other client subsystem. 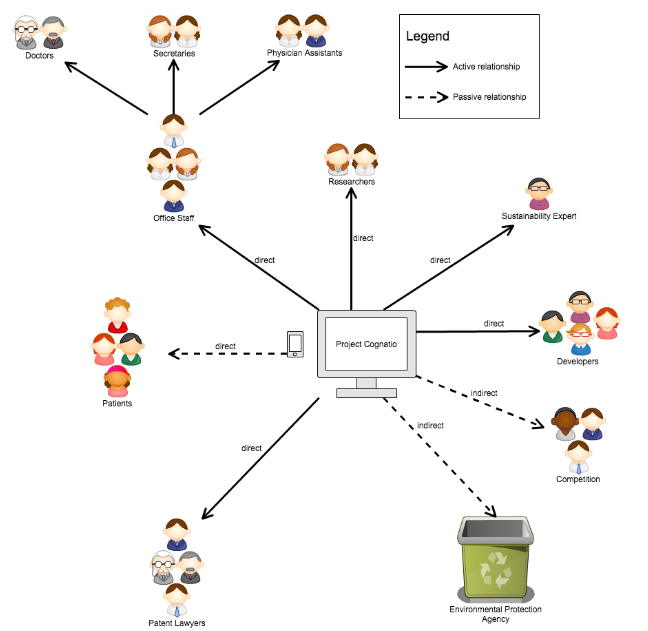 Solid lines depict an interaction between a user and the system, and the dashed lines depict the actions that the system itself performs to manipulate and transmit any reported or updated data. For example, the secretary uses the desktop system to send a reminder to the patient to take medication, and that patient uses the mobile application to receive the reminder and hopefully adheres to it, improving his or her health and thus overall Human Sustainability. Another example involves the patient sending data to the desktop system. When he consumes his medication, he uses the mobile application to report his consumption. This data is transmitted to the desktop system, and it is viewable by his doctor. This system will contribute to all ﬁve dimensions of sustainability through ﬁrst, second, or third order effects. Direct, ﬁrst order effects are the immediate opportunities and effects created by the physical existence of software technology and the processes involved in its design and production. Indirect, second order effects are the opportunities and effects arising from the application and usage of software. Systemic, third order effects, ﬁnally, are the effects and opportunities that are caused by large numbers of people using software over time. Human/Individual Sustainability: The system is designed to promote the health of those who receive treatments from their doctors. The mobile application will help patients adhere to the use of their medications to improve their health. As this system is aimed toward healthcare, improving Individual sustainability is the primary focus of the system. Economic Sustainability: Adherence to medical treatments will prevent patients from encountering even worse health problems, following up with their doctors, or attending hospitals. Each of these situations raises healthcare costs of the patient and others in the United States; a second order effect. Environmental Sustainability: The mobile application is designed to have the patient adhere more closely to his treatments in order to prevent follow-ups, which entail transportation to the doctor’s ofﬁce possibly in the form of driving. The reduction in the needs to drive decreases carbon emissions and gasoline consumption. Closer adherence to the provided medication will also reduce the need to dispose of unconsumed medication into the environment (2nd order). Technical Sustainability: The system should be available on a wide variety of platforms, making it compatible with many mobile and desktop devices, reducing the need for users of the application to dispose of their older technologies to utilize this application (2nd order effect). Social Sustainability: A decrease in the need to drive to the doctor’s ofﬁce will reduce trafﬁc on the roads, allowing other drivers to get to destinations more quickly (2nd order effect). Case Study, Example Case study, Environmental Sustainability, Medical, Social Sustainability, software tool, team, Use Cases. permalink.